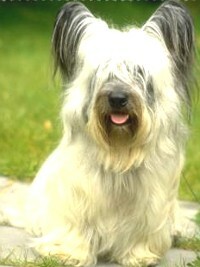 The Skye Terrier was first registered with the AKC in 1887 and is one of the oldest terrier breeds. Originated on the Isle of Skye off the west coast of Scotland, these stout, hirsute little guys were bred to rid farms of small predators like foxes and badgers. The breed was popularized by Queen Victoria in the 19th century. The Skye is the only terrier belonging specifically to the northwestern islands that is uncommon to the whole of Scotland. The Skye Terrier is a medium sized dog (ranging from 35-45lbs) twice as long as he is tall. It has a feathered double coat that falls like a veil over the face to protect the breed from sharp brush and serious encounters with other animals, as well as the cold, wet Scottish weather. Skye Terriers have large symmetrical ears that can be either pricked up or dropped down; feathery hair falls around them like a fringe. They come in black, blue, dark or light grey, silver platinum, fawn or cream colors. Compared to many breeds, Skyes are still considered quite healthy and live an average lifespan of 12-15 years. The Skye Terrier is a courageous dog with lots of strength and stamina. Though they are good tempered, they are also fiercely loyal – making them friendly and easy-going with people they know but reserved and cautious with strangers. They are a sensitive breed (though not submissive) with a mind of their own; people must earn the confidence, love and respect of a Skye. The Skye’s devotion makes them alert protectors of the home and family. Skyes are adaptable dogs that are usually happy with whatever level of exercise its owner is able to provide. Many Skye Terriers have the energy and enthusiasm necessary to make them great obedience and agility dogs. Skye Terriers should be brushed a few times a week to keep their coat from matting. The most common health concern in Skyes is the premature closure of the distal radial growth plate. Skye puppies that are exercised too often or too vigorously can develop this condition which may lead to a painful limp and badly bowed legs. Mammary cancer is the leading cause of death in Skye Terriers. Other common health issues include Hemangiosarcomas (malignant tumor of the blood vessels), Autoimmune disease, and Hyperthyroidism. One of the toughest things for me to accept as a child was that my mother was allergic to dogs. I was just as obsessed with dogs then as I am now but rarely got the chance to spend time with them. Instead, I combed through the glossy photos of a breed book over and over, learning about the different types that could some day be mine. I was always partial to the furry dogs – Chow Chows and Keeshonds, in particular – but pretty much all Spitz and Northern Breeds fit the bill. 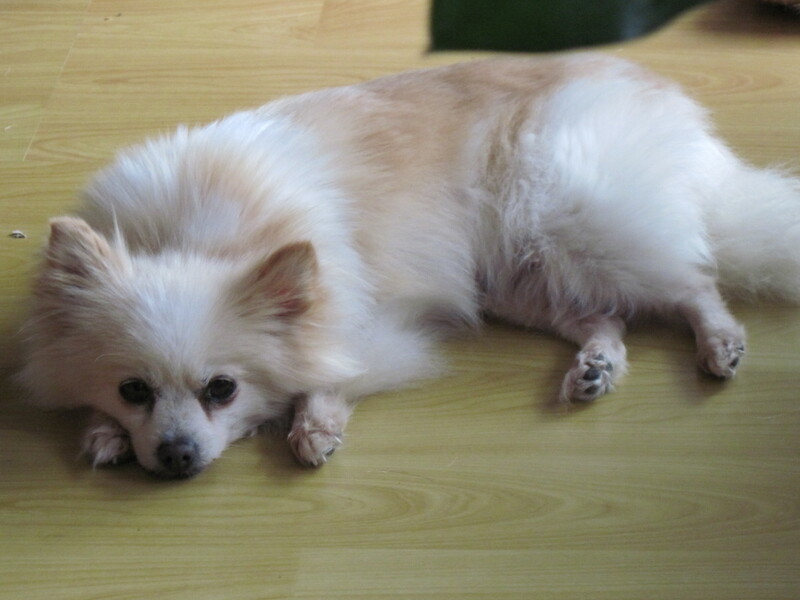 So the fact that I have now had three foster Pomeranians, a toy Spitz breed, is a lovely coincidence. My first Pom was Honey Bear. She wasn’t just my first Pom, but my first foster dog. Honey Bear, we believe, was a puppy mill mama. She was dropped off at a shelter to be euthanized with severe hemorrhaging after giving birth to a litter of puppies, none of which survived. At the age of 8+, Honey Bear should not have still been giving birth to puppies so the fact that she ended up at the shelter was probably a blessing in disguise. The shelter staff and volunteers found her to be so sweet and gentle that they pooled their money to pay for Honey’s operation. By the time she got to me, she had spent over two months in the shelter. 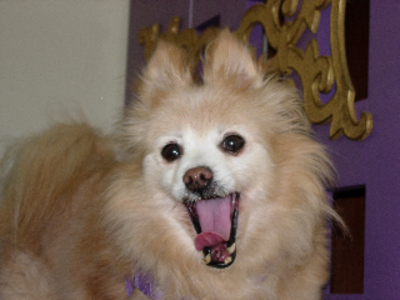 My second Pom was Debbie who was found wandering the streets in Bayview Hunter’s Point. . To this day, Debbie remains one of my favorite foster dogs. This goofy, toothless little creature was with me for four months before she found her forever home and I still sometimes regret giving her up. And now, little Layla has joined our lives. Layla shares a lot of similarities with the other Poms, especially Debbie’s goofiness, but she is also the most classic looking Pom I’ve had. At six pounds, this champagne colored girl has a foxy face, a huge fluffy coat and a perfect fluffy tail. With all these great furry girls in my life over the past 18 months, I was curious to learn a bit more about the Pomeranian. The first recorded reference to the Pomeranian was in 1764. The breed is descendent from the German Spitz and was developed in the Pomerania region of Poland and northern Germany. Pomeranians were made famous by the British Royal Family, beginning with Queen Charlotte in the late 1760s. But it was Queen Victoria in the 1890s who is responsible for developing and promoting the modern Pomeranian; her Pomeranian breeding kennel decreased the size of the dog by 50% from an average of 30lbs+ to an average of 12-15lbs. Once the Pom’s size decreased, it joined the ranks of the Pekingese and other toy breeds as a royal sleeve dog – a dog held in the wide sleeves of female royalty to warm their hands. Today the Pomeranian ranks the 15th most popular breed in the US (as of 2010). 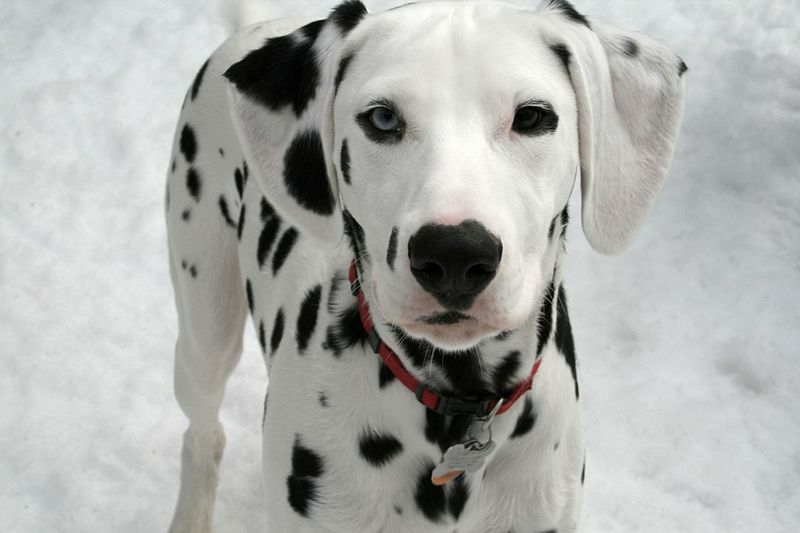 They can come in a variety of colors, from black to white. Pomeranians are intelligent and easily trainable. They are also good alarm dogs because of their high pitched yips. Poms are usually friendly and bond very closely with their owners. Since they can live for 12-16 years, a 9yr old like Layla has lots of time left to enrich the life of a deserving family. If you are interested in adopting Layla, visit www.muttville.org!